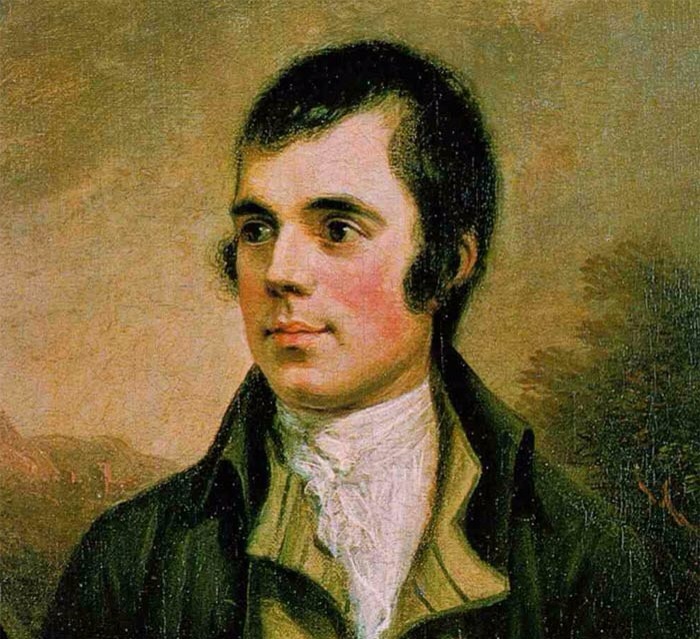 Burns night is celebrated annually on 25 January to mark the birth of Scottish poet and lyricist Robert Burns who was also known as Rabbie Burns or the Bard of Ayrshire and is widely regarded as the national poet of Scotland and is celebrated worldwide. He was born 25 January 1759 two miles (3 km) south of Ayr, in Alloway in a house built by his father (now the Burns Cottage Museum). In Easter 1766, when Robert was seven years old he moved to the 70-acre Mount Oliphant farm, southeast of Alloway where he grew up in poverty and hardship. He had little regular schooling and got much of his education from his father, who taught his children reading, writing, arithmetic, geography, and history He was also taught by John Murdoch (1747–1824), who opened an “adventure school” in Alloway in 1763 and taught Latin, French, and mathematics from 1765 to 1768. In 1780 Robert and Gilbert moved to the farm at Mossgiel, near Mauchline, in March. In 1784 Burns met The Belles of Mauchline, one of whom was Jean Armour, the daughter of a stonemason from Mauchline. During this time Robert Burns also had manyLove affairs His first child, Elizabeth Paton Burns, was born to his mother’s servant, Elizabeth Paton. Jean Armour, also became pregnant with twins in March 1786 while Burns was with Paton and To avoid disgrace, her parents sent her to live with her uncle in Paisley. Although Armour’s father initially forbade it, they were eventually married in 1788. Armour bore him nine children, only three of whom survived infancy. Despite being hugely popular he had alienated many of his best friends by expressing sympathy with the French Revolution and unpopular advocates of reform at home. His political views also came to the notice of his employers and in an attempt to prove his loyalty to the Crown, Burns joined the Royal Dumfries Volunteers in 1795. Unfortunately his health began to deteriorate due to a possible rheumatic heart condition and On the morning of 21 July 1796, Burns died in Dumfries, at the age of 37. The funeral took place on Monday 25 July 1796, the day that his son Maxwell was born. He was at first buried in the far corner of St. Michael’s Churchyard in Dumfries; a simple “slab of freestone” was erected as his gravestone by Jean Armour, which some felt insulting to his memory. His body was eventually moved to its final location in the same cemetery, the Burns Mausoleum, in September 1817 and The body of his widow Jean Armour was buried with his in 1834. Burns was posthumously given the freedom of the town of Dumfries, and was also made an Honorary Burgess of Dumfries.